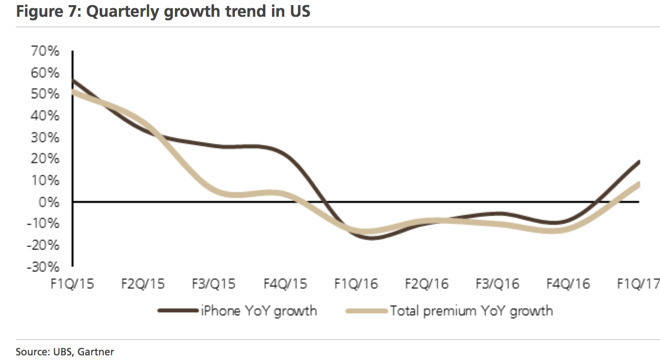 In a report provided to AppleInsider, Steven Milunovich of UBS writes that the US premium smartphone market returned to growth in the December quarter at up 8 percent with Apple outgrowing the market with a 19% growth. Correspondingly, in Europe, the premium market swelled 4 percent, with Apple climbing 16 percent. Apple continues its dominance of the Japanese premium iPhone market. Apple's market share is up to 70 percent in the country, with Sony second at 16 percent, and Samsung vastly behind at 3%. China's numbers remain impacted by Vivo, Oppo, and Huawei claiming a combined 45 percent of the market. While the market grew 9%, the iPhone declined 19 percent. Apple remains the largest vendor in the country, with 47%. Samsung held 4% of the China market. When the Hong Kong and Taiwan markets are separated from the Mainland China market, the picture is different. The decline in Mainland China itself is 5%, with the vast majority of the decline coming from Hong Kong's 50% fall. 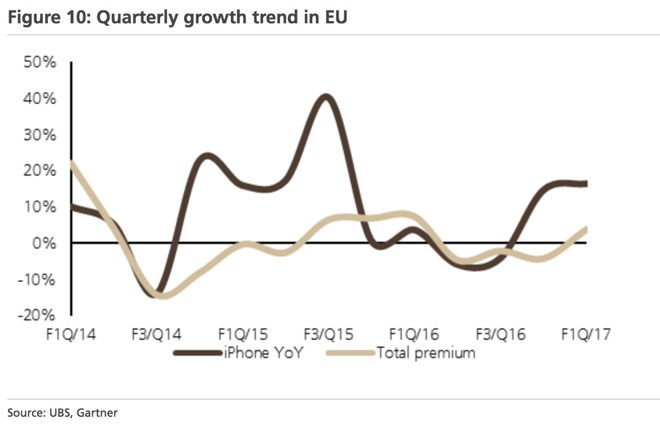 Regardless of the decline of Apple's iPhone sales prior to the launch quarter of the iPhone 7, Apple continues to out-perform the premium category in the rest of the world. The entire category rose 4 percent, with Apple gaining 31 percent mostly at the expense of Samsung, with many of the sales to new customers. For the remainder of the calendar year, Milunovitch expects a "bulge" of iPhone 6 owners to upgrade after the expected September "iPhone 7s" and/or "iPhone 8" releases. The firm has "tempered" it's iPhone upgrade expectations for Apple's fiscal year 2018. but has grown what it thinks it will see in 2019. As a result of future predictions, coupled with international iPhone 7 sales, Milunovitch is setting a $151 Apple stock price target, possibly reaching $165 depending on iPhone 7 sales figures throughout the fiscal year. Other analysts claim that the Apple iPhone continues to grab the vast majority of smartphone profits globally. Other vendors, including Samsung, continue to be impacted by largely profitless production of massive numbers of lower end models.